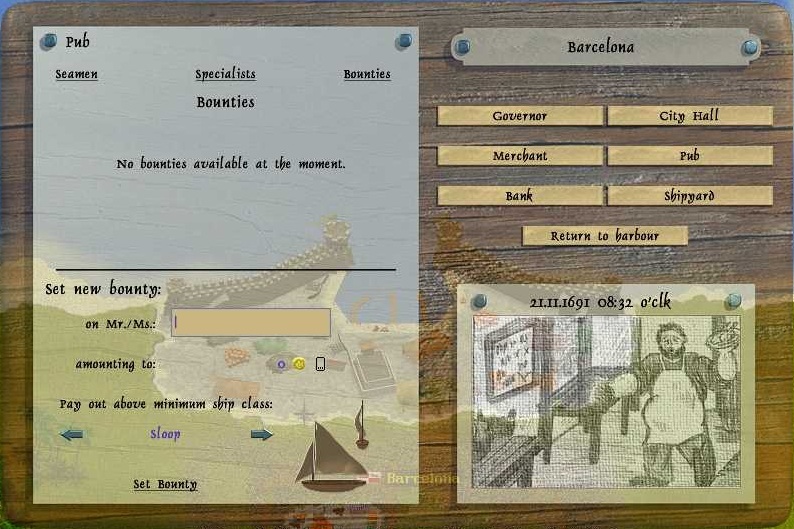 When you press pub, you get to the seamen part of the pub, here you can hire or dismiss shipboys, seamen and veterans. 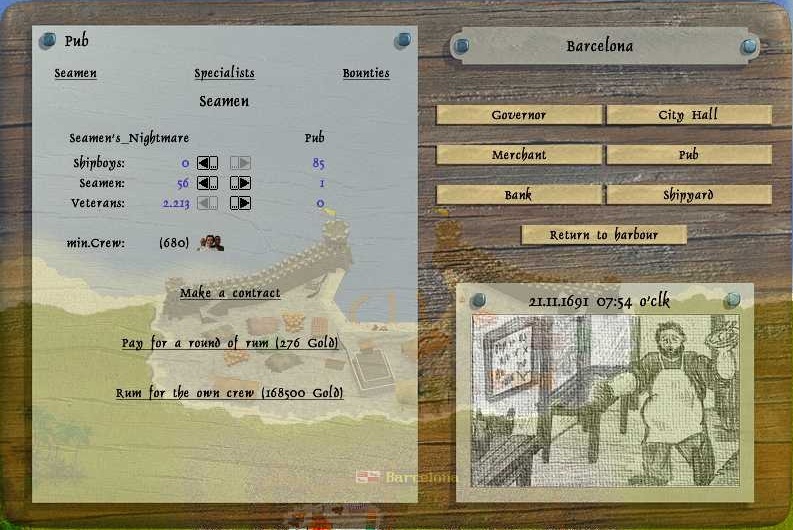 Normally there is mainly only shipboys in the pub, but you can make more shipboys, seamen and veterans appear, by pressing pay for a round of rum. When too many crew in the city, you cannon buy rum to make more. But if you want to keep making more veterans you can hire and dismiss shipboys and seamen, this will lower the amount in the pub so you again can pay for rum to make veterans. Rum for the own crew is used for boosting moral of the crew on your fleet. When pressing specialists, you get a list of all the specialists available in the pub, by pressing on a specialist you get a detailed description of its skills and requirements to hire it. If you press description at the bottom left, you get a box telling what the specialist is for. Press hire to hire the specialist you are looking at. Learn more about specialists here. if no bounties at the nation of the city. If there are bounties available they will show up as a list, with the amount of gold the bounty has. 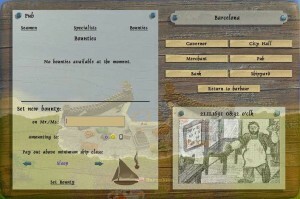 There can be bounties on cities if someone captured one of same nation as the city you are in. 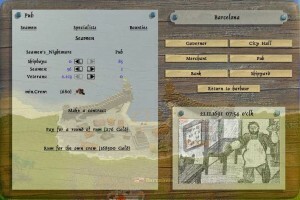 There also can be bounties on players, here they will show up at the cities of same nation as the city the bounty was set at. 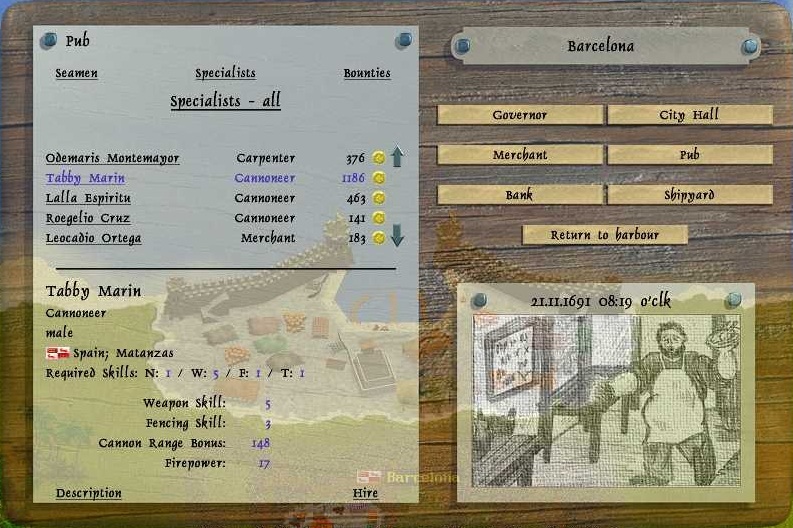 Then with the arrows choose what minimum ship class you want sunk, for people to claim the bounty and press set bounty at bottom.